Wedding season is in full swing. Especially at my age, it seems like every time you turn around there's a new save the date or wedding invitation or adorable photo shoot popping up in your mailbox or newsfeed. Sometimes it's nauseating, but most of the time, I find myself overjoyed at the happiness of others. With that in mind, I felt it necessary to share five of my all-time favorite fictional weddings. It was pretty hard to nail down only five, so I may have snuck a few runners up in as well. Scrubs will always be one of my favorite shows. Aside from the constant "will they, won't they" surrounding J.D. and Elliot, it's clear that Turk and Carla are the cornerstone romance of the series. This isn't to say that they don't struggle; they do significantly and realistically so. In the twenty-second episode of season three, Turk and Carla's long anticipated wedding arrives and things well...go wrong in a way that only sitcom weddings can. Yet it embodies their relationship so wholly. Turk agrees to go into work the morning of their wedding, and his "quick routine surgery" ends up being a lot more involved than anyone realized it would be. He repeatedly calls ensuring a later and later arrival. When he finally arrives at the church, it's the wrong church and George Takei is the priest. From there, he heads to the reception, and the two get past the frustration that the day hasn't gone as planned and enjoy themselves. At the end of the night, Turk insists on checking on the man he operated on earlier that day, a man who happens to be a priest, and the two are married at the foot of his hospital bed. I love this story because it fully embodies the struggle, perseverance, and love demonstrated within their marriage through the rest of the series. 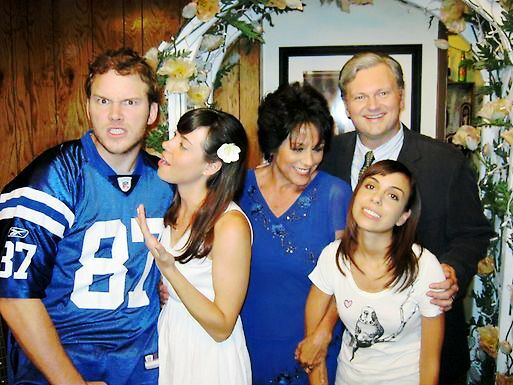 There is more than one worthy and wonderful wedding in Parks and Rec but one in particular has always stood out to me: Andy and April. It might be due to the fact that I sometimes wish that I had the guts to pull something like this off; it might be due to the fact that I have a penchant for rooting for the underdog. Overall, this episode is heartwarming. April and Andy hadn't been together for very long, but they decided that there really was nothing stopping them from getting married. So, they invited all their friends and family to a dinner party and surprised them with a wedding. Leslie panics, full of statistics and somewhat realistic fears. Other friends are more supportive of this choice, but overall, the couple in question realize that this is their decision to make alone. They do so with bravery in the face of a completely uncertain future. In their logic, things will work out because they have each other's support. In the end, what matters more? By the time they got married, Lily and Marshall had been together for over ten years. Although they'd gone their separate ways for a while, both had come to realize that they're better together than apart. Then comes their wedding day. Upon its approach things got farther and farther from the ideal. But they pull it together with the help of their friends. That's what's beautiful about it: friends coming together to support those that they love. Ted, Barney, and Robin saw that Lily and Marshall were completely freaking out about small disasters mounting into larger ones and decided to give them the intimate outdoor ceremony that they'd always wanted. Because of this, they were able to go into their real ceremony in peace with their secret wedding to cherish. The end of Return of the King could also be referred to as, "and then almost everyone got married." Which I love, because that we get to see something often neglected in telling the story of a major conflict: life went on for the characters involved. Yes, The War of the Ring is the central focus of the series, but it's thirteen months of these characters' lives. What happened afterwards and how it affected them is just as important. One of my favorite things about the end of ROTK's film adaptation is that Samwise gets married to the kind and wonderful woman that is Rosie Cotton. Sweet, simple, and innocent, their wedding is a glimpse of what being a hobbit is actually like. It is a celebration of the joys of the simple life. We don't get to see a lot of what their relationship is like, but we can surmise that it is indeed a happy and supportive one. Do I have to explain this one? Yes, yes, I do. One of my favorite things about Rapunzel and Eugene's relationship is that everything is on their terms. Although they fell in love quickly, they waited until they were good and ready to get married. I feel like this is a good example to set forth in the animated world. I love these two as a couple and all that they stand for. I understand why Peter Jackson needed to cut Eowyn and Faramir's wedding, but I am forever bitter that it was not in any of the million hours of extended editions. I want photos. The costume designer said that the pieces made for their wedding were her absolute favorite out of any in the films. Someone on the planet earth has the stills and footage from this scene. I want to drive to their house and demand to see anything they have on the matter. If they're kind I might even throw in dinner. What is your favorite fictional wedding and why?